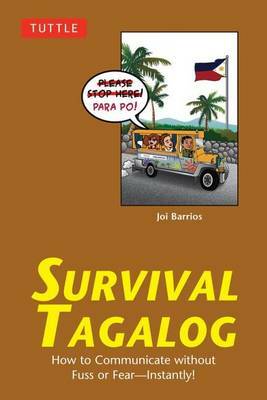 A handy Tagalog phrasebook and guide to the official language of The Philippines, Survival Tagalog contains basic vocabulary necessary for getting around. This book contains all the necessary words and phrases for speaking Tagalog in any kind of setting. Perfect for students, tourists, or business people learning Tagalog or travelling to the Philippines, it also contains a beginner guide to the Tagalog language, allowing for a deeper understanding of Tagalog than a typical Tagalog phrasebook or Tagalog dictionary. The book is broken into five basic sections: Common Tagalog Expressions and Key Words, Numbers and Counting in Tagalog, Tagalog Travel Vocabulary and Useful Tagalog Expressions, Filipino Geography Guide and Readings Signs in Tagalog, and Additional Tagalog Vocabulary Pronunciation Guides for Key Filipino Names and Signs. All Tagalog words and phrases are written in Tagalog as well phonetically, making pronouncing Tagalog a breeze. For example, the word for good morning, Magandang umaga is also written as ma-gan-dang u-ma-ga. Since written Tagalog is included, in the case of difficulties the book can be shown to the person the user is trying to communicate with.